KARACHI: Pakistan Tehreek-e-Insaf (PTI) Karachi President Firdaus Shamim Naqvi on Sunday said that the alliance with Muttahida Qaumi Movement-Pakistan (MQM-P) was made due to certain necessities. Addressing a press conference, Naqvi said that he stands by on his accusations levelled against the MQM-P and the party went into alliance with them because they had not enough party votes to elect Imran Khan as leader of the house in the National Assembly. The PTI leader said that members of Pak Sarzameen Party, All Pakistan Muslim League and MQM are joining the party fold, but added that he is ensuring that the new entrants don’t hold criminal background. “We can’t afford to include criminal elements in the party,” Naqvi added. Faisal Sabzwari, a central of MQM-P, in his reaction to Naqvi’s statement said that the working relationship between the two parties will be affected by such statements. “We will put forward the statements before PTI leadership and will ask them about the compulsions,” he said. Separately, MQM leader Farooq Sattar chose to reserve his answer when he was asked about his absence in the meeting of party leaders with Imran Khan at Bani Gala. “This question should be asked from Khalid Maqbool Siddiqui. I believe that MQM members should not take ministries,” he said. 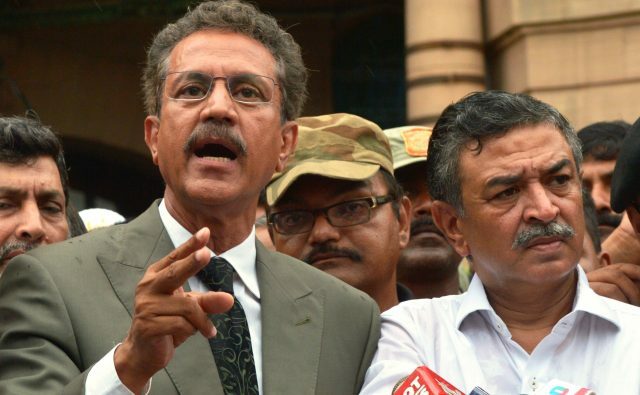 Earlier in the same day, MQM-P leader and Karachi Mayor Wasim Akhtar said that his party had no other choice but to join hands with the Pakistan Tehreek-e-Insaf (PTI) as the other parties, the Pakistan Muslim League-Nawaz (PML-N) and the Pakistan People’s Party (PPP), had already been tested by the people. Mayor Akhtar said, “The problems of the city are no more a political issue, rather it has now become a human issue.” “The country is heading to a disaster, therefore, all political parties and organisations must think about Karachi’s problems,” he added. “In such serious conditions, we chose to sit with PTI chairman Imran Khan and put up our issues in writing,” he concluded.